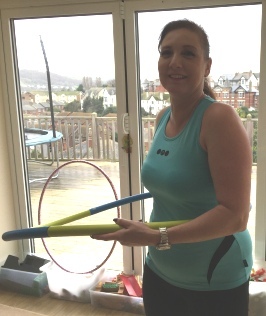 So the final results are in on my 6 week alternative exercise program using my hula hoop! I only started this because of something I had read in a magazine and thought may as well give it a go! And I did for 10 minutes every day. I found it really easy to do as you could do it whilst dinner was cooking in the oven, or whilst watching your favorite TV program, (mine without doubt is Coronation Street), whilst the children had a nap, or any moment throughout the day you had a spare few minutes. The hula hoop I purchased is collapsible so even if you nip away for a couple of nights, you can take it with you! It’s also good if your short on storage. When exercising, I got very hot and sweaty so felt I must be burning up some of that stubborn and hard to move belly fat! But was I? 5lbs in weight and a whole 5cms, that’s an amazing 1.9 inches off my waist!! I got my hula hoop from Argos and it was a Davina Mccall collapsible for easy storage and ability to take places with you. It cost £14.99. She also does another at £21.99. I hope these links below will be useful in getting yourself started. If you want any advice from me then please feel free to make contact and I’ll try my best to help you out. This is the video I watched to get me started. Hope it helps you too! It has been a strange week of ups and downs, Eureka moments, and plodding on with my alternative exercise program. To start with, two meals out for Birthday’s, so the odd glass of wine, hasn’t helped the weight loss although I did try my best to order sensibly from the menu. I have, however, stuck to it and done my 10 mins hula hooping every day. I thought that by now I would be doing really well. On reading other peoples accounts after the three weeks I’ve done they were able to walk about whilst hooping! This made for very difficult week as at the start of this week I was almost back to square one. If I could keep it up for a few seconds it was a miracle. I felt quite disappointed. Then I had a complete “Eureka” moment and remembered something I had read someone else had written about hula hooping where they had said how important it was to wear appropriate clothing. So armed with this information, I donned my gym kit and “Eureka” my hula hooping improved immediately. I felt back on track and ended up at the end of this week being able to keep the hula hoop up for several minutes rather than seconds. I don’t think I am at the stage yet where I can start moving about at the same time but then, we all do things at different stages, and as I have seen improvement this week, then I’m happy! – What you wear when hula hooping is important. – We don’t all do things at the same speed so don’t worry if your not as far on as others. – Keep going – I lost another 0.3kg this week. Not much but it is going in the right direction! So it has now been a whole week since I first picked up a hula hoop since the age of 11 and embarked on my alternative excise program. How did it go? Well lets just say the children and husband have had many a giggle. To start with I was terrible! I spent most of my time bending down picking the hoop up, still good exercise all the same. And the exhaustion! I have never known 10 mins to be so long! Anyone who has tried this form of alternative exercise recently will know how tiring it can be. I regularly go to a keep fit class and yet 10 mins of hula hooping can reduce me to a hot sweaty mass almost unable to speak. I set myself 10 mins a day and slowly I did manage to keep the hula hoop up for a few rotations and then a few more. Now a week is over and after 70 mins practice, being 10 mins a day, I can keep the hula hoop up for some considerable time, between 50-100 rotations. And the even better news is that I have lost 1.3kg this week, and for us old ones that 2.8lbs. I have combined this with cutting out the wine and trying to stop snacking too, but seems that there may be something to this alternative exercise after all. The annoying thing is that I forgot to measure my waist at the start but I did remember to do this a few days ago so at the end of next week it will be interesting to see if there has been any inches lost there too. Get out and get a hula hoop. Its fun, all the family can do it, it’s cheap as no gym fees. I got my hula hoop from Argos for £14.99. I found that it is crucial where you start with the hula hoop. For me holding it just on my bra line under my bust worked he best. Anything higher and it was a disaster, anything lower and it didn’t have time to get going before it fell to the floor. Stand with one foot in front the other rather than side by side as I tried to do. Just go and have fun! Look out for next weeks follow up. See you then……..
It’s that time of year when we decide to take the plunge and stand on the dreaded scales! And to do something about my weight I’m going to start exploring alternative exercise for the New Year annual weight loss panic! So after my big op last year, I have been piling on the pounds due to being unable to exercise and Christmas eating! Lets also not forget the wine too! So now I’m an old bird it takes so much longer to get it to shift which is really unfair on us oldies. However, I am going to watch my diet, get back to doing some exercise at my favourite Tums and Bums class three times a week, and try and finish Dry January. This failed completely yesterday when friends came round for dinner. After all , it would just be rude not to have a glass or two of wine with them. Given I am on this health thing I have had a look on the interweb and looked at the do’s and don’ts. This just made me feel very confused! There are so many different diets, suggestions and advice that I have just decided to do my own thing. After years of trying to keep fit and watching what I eat on various apps, it’s not rocket science to know that if you put too much in your body it ends up on your hips, waist and all the other places you don’t want it! So I wanted to spice things up a bit and started to explore alternative exercise regimes. One of these alternative exercises brought back fond memories of my school days. It was the humble hula hoop. Easy to use at home, do anytime of the day, seems the perfect alternative exercise, after all, I was brilliant at it when I was 11! So today I am going to start my regime and keep you updated on how I get on. I’ve even bought a hula hoop to try an alternative exercise which, I read, can help you lose up to 2” off your waist if used for 10-15 mins a day. Well let’s see shall we……. Having 2 boys I needed to order 2 books- therefore resulting in having the same story twice but with 2 different names. I think you need more stories. Also I would have liked to use the name mum and dad in the book but you have to you either only which is slightly annoying. Otherwise the quality is good and it's a nice story. Click to read more CreateMeBooks reviews at Reviews.co.uk. Help, I've lost my password!